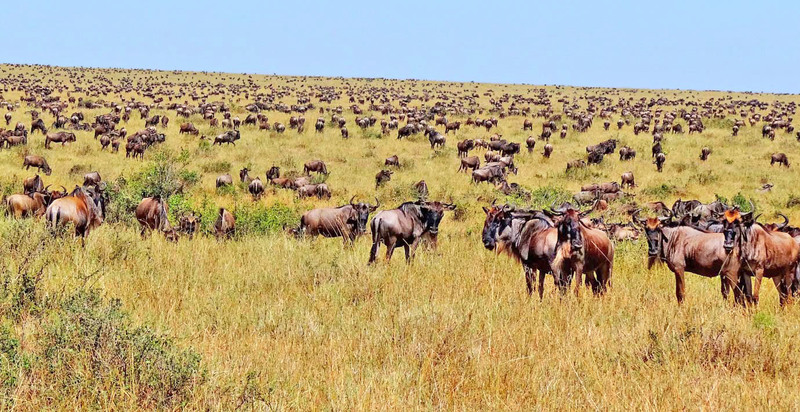 The southern plains of the Serengeti turn green after the November rains, and fresh grazing is just what the wildebeest need for their energy-demanding calving season: several hundred thousand wildebeest are about to be born and it’s going to get busy. The season is short-lived but epic in scale. 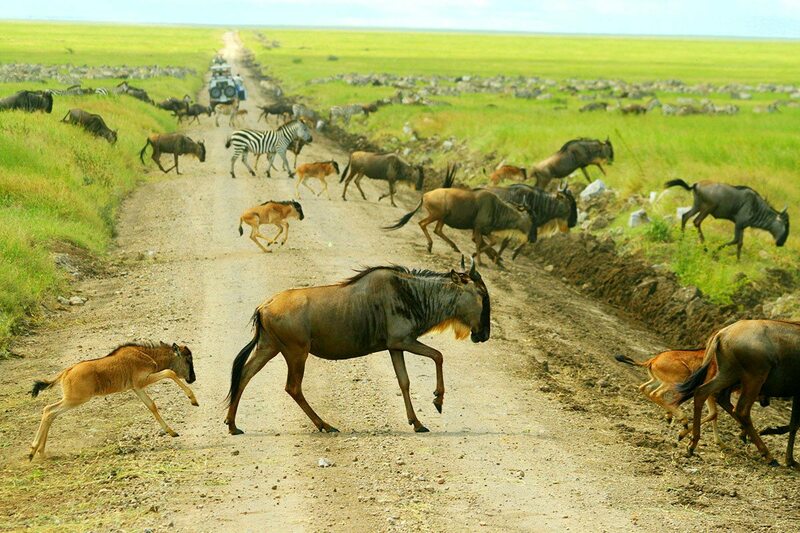 In December, great waves of wildebeest come spilling out of the Masai Mara and into the southern Serengeti. The animals then fan out into adjoining areas such as the Ndutu region, Lake Masek and even the Ngorongoro Conservation Area. It’s an amazing scene, the last great concentration of large, wild land animals in the world, and the surrounding landscape is a beautiful one: short-grassy savannah studded with rocky outcrops – koppies, the favourite haunt of the Serengeti’s leopards. Then the calving begins. Generally starting in January, the pregnant wildebeest give birth and by February some 8,000 baby wildebeest are being born every day. The calving season carries on into March and is joined by other animals too. Tens of thousands of zebras and gazelles have accompanied the wildebeest on their trek and are taking advantage of safety in numbers to drop their young too. Such numbers of young and inexperienced animals are of course a magnet for Africa’s predators. The big cats – lions, leopards and cheetahs – stalk the southern Serengeti along with spotted hyenas, black-backed jackals and African wild dogs. Your chance of seeing predator-prey interaction and indeed a kill are very high during the Serengeti calving season – great news for wildlife photographers if not for the wildebeest. 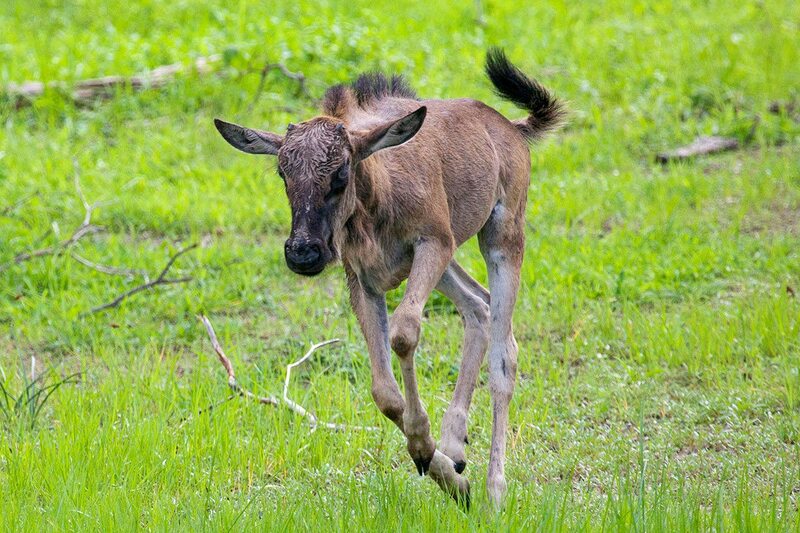 But the new-born wildebeest calves are quick to their feet: standing in minutes and able to run with the herd within three days. Most survive the onslaught of predators and by the end of March, the grasses of the southern Serengeti are exhausted. The wildebeest begin marching west in great lines, across the central Serengeti and to the muddy rivers that block their way back to the Masai Mara. Here the wildebeest pause: the notorious migration river crossings are about to begin. When should I book for the calving season? Good question. Experiencing the Serengeti calving season does need a bit of forward planning. Although it is considered the low season, accommodation books out fast. The relevant months are January, February and March: if you have specific dates in mind then we recommend booking up to a year in advance – especially for February when the calving season is at its most dramatic. If you are not specific about dates within the January to March calving period, then we advise booking six to eight months ahead – the sooner the better for February! The best camps for the calving season lie in the Ndutu area, south of the Serengeti. Many are semi-permanent tented camps set up each year in the path of the migration, enabling you to leave camp on early morning drives and head straight into the action. Your accommodation usually takes the form of a large, walk-in tented suite with a large bed, outside seating area and a private bathroom. 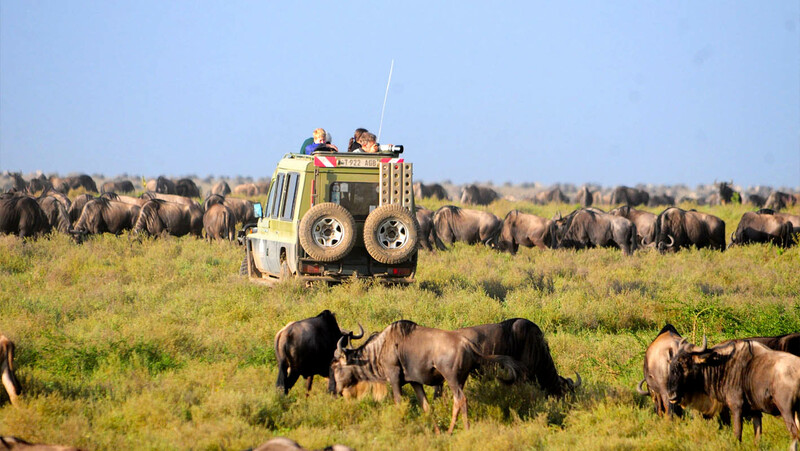 We suggest three nights in the Ndutu area and two nights in another destination to complement the migration experience. 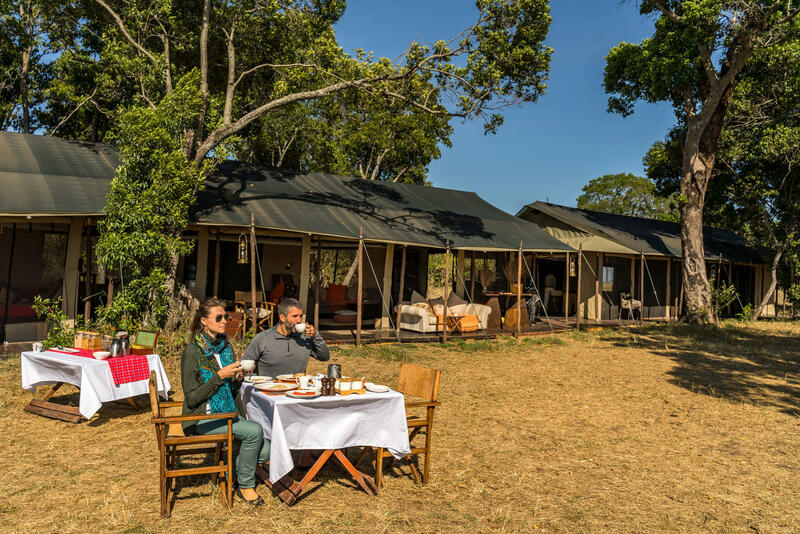 Perhaps a camp in the Central Serengeti, home to excellent resident wildlife, or – since Ndutu forms part of the Ngorongoro Conservation Area – a lodge at the nearby Ngorongoro Crater, home to Africa’s most reliable Big Five game viewing. What activities can I expect to do? Wildlife viewing during the calving season is usually enjoyed from the vantage of an open-sided 4X4 vehicle in the experienced hands of a professional guide. You’ll have two drives a day – one in the early morning and the other in the afternoon, returning in the early evening with a spot-light leading the way. And since our recommended accommodation for the calving season lies in privately-run concessions rather than the Serengeti National Park, your guide has the advantage of being able to drive off-road for exceptional sightings and you have the chance to go on walking safaris with Tanzanian park rangers. Village visits are another popular activity. Accompanied by your guide, you can visit a local community to learn about Maasai culture and traditions, and perhaps watch Maasai warriors perform their famous ‘jumping dance’. One of the Serengeti’s signature activities – hot-air ballooning – is not available in the Ndutu region but certainly is an option in the central Serengeti. It’s an hour and a half’s early morning transfer there from Ndutu but the best option is to combine Ndutu with a stay in the central Serengeti. Is it only the wildebeest who give birth or do other animals also have their young at this time? If you would like to see lots of baby animals of all types, then this is the time to go. Large numbers of zebra foals and gazelle fawns are also running around on the southern plains, using the cover of hundreds of thousands of wildebeest calves to try and avoid predators. The sudden growth of greenery prompts many resident animals into their main birthing season – suddenly the open woodlands are home to warthog piglets and baby baboons, wobbly-legged giraffe and baby elephants with trunks they can’t quite control yet. The equally abrupt abundance of herbivores means Africa’s large carnivores ensure their birthing season coincides with the arrival of the migration. Lions, cheetahs and leopards generally have their cubs at this time of year, sightings of which are among the most popular for photographers. Where else should I go during the calving season? If you want to keep it local but would like a complete contrast to the Serengeti and Ndutu, then Tanzania’s Tarangire National Park is a good choice. It’s not high season over January, February and March and there will be some rain but the landscape is beautifully green, there will be very few other visitors and the wildlife very different to the migration experience. Still, in Tanzania, the best and most easily accessible beach destination is Zanzibar. January through March is a great time to visit the "Spice Island". The days are warm and sunny and the Indian Ocean is at its clearest, making it an excellent time for divers and snorkellers. 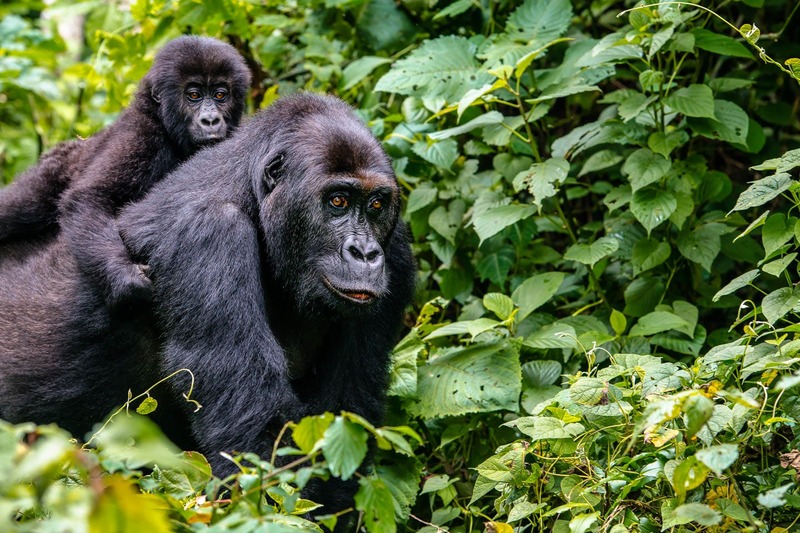 For a wildlife experience equal in drama to the calving season, gorilla trekking in the equatorial forests of Uganda and Rwanda brings you face to face with a family of one of the world’s largest and most endangered primates. Gorilla trekking is ideal in January, February and March. These months make up one of the region’s two dry seasons and conditions in the rain forest are at their easiest.